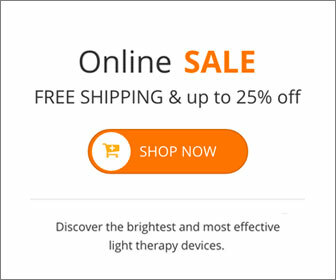 If you are someone that suffers during the dark, cold winter months, then now is the time to start using your light box! With Seasonal Affective Disorder (SAD) and the Winter Blues, millions of people around the world can’t seem to enjoy the holiday season. SAD is a type of depression that causes you to not want to get out of bed in the morning. Many people that suffer from SAD tend to eat a lot which causes them to put on some weight and in turn, that just adds to their depression. It is always recommended to be ahead of the game and start your treatment before you’re feeling down. It is always recommended to start using light box therapy for depression before any SAD symptoms become present. Using your light about 2 weeks before your symptoms normally begin to appear will help regulate your body and possibly stop the winter blues from ever ruining your season! If you wait until you are feeling down and then start using your light therapy box, it can take up to 10-14 days until you start to feel the benefits of lighting for depression. Why suffer another day when you can just sit in front of a light box for 30 minutes each morning and avoid any symptoms at all! This entry was posted on Tuesday, November 7th, 2017 at 10:35 am	and is filed under Depression, Light Therapy, SAD. You can follow any responses to this entry through the RSS 2.0 feed.